This section includes non-technical case studies from Arizona State University, Swarthmore College, Smith College, Yale University, the University of British Columbia, and University College London. Each summarizes a school’s approach, design, and implementation process. 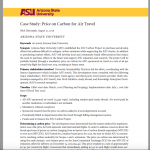 Among these case studies are examples of proxy pricing, levies, a redistributive carbon charge, a fee on air travel, and a response to an external carbon price. 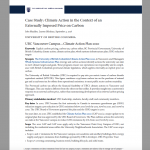 The case studies also outline time frames of each program’s development from earliest planning to implementation and how carbon pricing fits into each institution’s sustainability goals. ASU, which has nearly 100,000 students, is implementing an approach to pricing scope 3 emissions. It uses a flat fee of $8 per round trip on air travel. The revenue from this fee is then used to purchase market-based and community offsets. The initiative began in 2016 and was implemented in 2018. (See here for more information.) The case study emphasizes policy communications techniques. This is an example of proxy-pricing using life cycle cost in the facilities planning process. In its pilot stage the proxy price was used to evaluate two capital purchasing decisions and future purchasing options of renewable energy credits. Smith’s program highlights the potential for student involvement in developing a carbon pricing approach. Yale has implemented a revenue-neutral carbon charge based on the U.S. government’s estimated social cost of carbon. Yale began the work in 2014, ran a pilot project in 2015, and initiated full rollout in 2017. 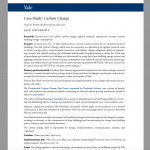 Yale, which has 5,453 undergraduates and 6,859 graduate students, offers more information on its carbon charge website, and through its task force white paper. 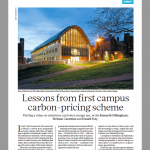 This is an example of how a university responded to an external price on carbon. The British Columbia provincial government requires the University of British Columbia to pay $60/MTCDE. 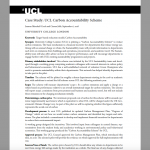 The case study outlines how the external carbon price impacts university climate action. University College London, with about 38,000 students, is piloting an incentive for departments to reduce energy consumption, coupled with energy use information from buildings, operations, procurement, and academic travel. 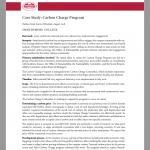 Article outlining lessons learned from Yale’s carbon charge. 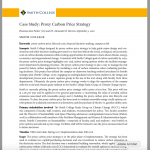 Outlines the three pilot carbon pricing schemes Yale tried and gives statistical evidence for performance.